A little mentorship every once in a while never hurt nobody no matter how promising or talented you are. Nigerian football over the years has produced great players and a catalogue of promising players who never made it to the top of the food chain. In the past, many players fell for wrong contracts and signed for clubs that ended up ruining their careers. A proper example was the case of Julius Aghahowa who was stopped from leaving Shaktar when he was at his peak. Many will also argue that despite Mikel Obi’s achievenents with Chelsea FC, he was still far from the player we saw in 2005 that gave Lionel Messi who is adjudged the best footballer ever a run for his money. Many still consider that move to Chelsea a mistake despite his success at the club. In the past, promising youngstars worked solo without any form of encouragement and guidance from older and experienced players which led to making wrong decisions and grave mistakes. Today, for whatever reasons best known to them, legendary footballers Nwankwo Kanu and Austin Jay Jay Okocha are putting in every effort to help fast rising and promising footballers like Kelechi Iheanacho and Alex Iwobi to stay focused and become the best in their trade. This is a welcome development as Nigeria prepares for the Fifa World Cup 2018 in Russia. Alex Iwobi who plays for Arsenal FC and a nephew to Okocha has improved tremendously and Iheanacho who recently moved to Leceister city for a record fee has broken the goal scoring record of any Nigerian in the English FA Cup. Both players in their early 20’s were pivotal to the success of the Eagles during the World Cup qualifiers. We hope to see them do more great things in years to come and also expect to see more players mentor our youngstars to greatness in order to produce the likes of Lionel Messi, Cristiano Ronaldo and Neymar in the future. 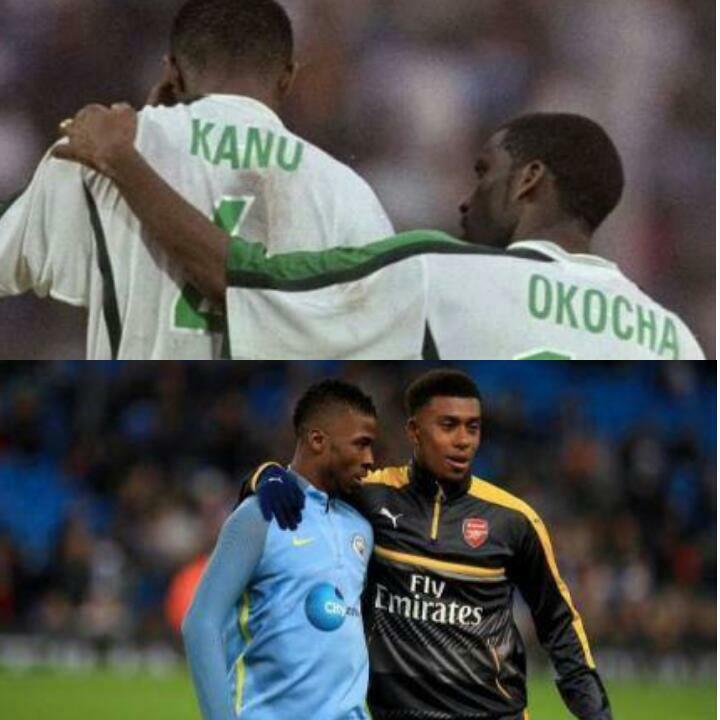 Once again, kudos to Kanu and Okocha.